The symbol on the front represents Infinity or Eternity. How long is that? It is forever and ever and ever. That's a LONG TIME! Even if you live to be 100 what is that compared to forever? Comparing 100 years to eternity is like comparing inches to millions of miles. The Big question is where will you go when you die and step into eternity? You can know by looking at the Ten Commandments. Have you ever lied? Ever stolen before? Ever looked with lust? Ever taken God's name in vain? If you have broken just these four of the Ten Commandments, God sees you as a liar, a thief, an adulterer at heart (Matt. 5:28) and a blasphemer. If you die in your sins you will spend eternity in Hell. That's NOT God's will for you! Jesus Christ lived a sinless life, died on the cross and rose again. He did this to Cleanse and Pardon you of your sins, Reconcile you to God so you can have a relationship with Him and Empower you to live a Holy life. If you will Repent of your sins (turn from them) and Trust Christ He will save you and change you! Do it today before you step into Eternity! 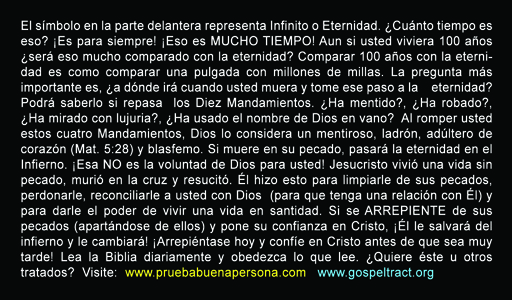 This is a great way to reach those who I can't properly communicate with as I only understand a few words in Spanish. 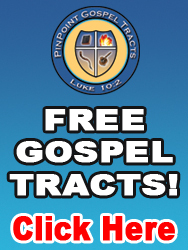 With this tract not only is the picture quality great as it catches their eye immediately and captures their curiosity but it also has the straight forward gospel message on the back, all in a size that encourages them to keep it in their wallet as they go.